Courtesy of United Country Lifestyle Properties and Land Co., Mario Gattavara. Beautiful 7+ acre parcel of land with 3 bed 2.5 bath semi private home on the outskirts of Magalia. Paved to properties edge. Awesome large scale trees fill the terrain. Large scale corner lot. Walking trails weave thru the trees shade banks below. You can feel mother nature wrapping around you in every direction. This is a beautiful, peaceful picturesque property. All of this land is walk-able. Majority of this property is for the most part flat to slightly rolling. Home sits off the main paved road away from traffic. Circle drive. Covered front porch and rear deck. Modern country kitchen. Dining area separate from living area. Master suite. Central hall. Isolated master bedroom. 3 car garage, however 1 has been converted to interior shop space; door still exists. Situated in a small CC&R community of 4 homes on similar sized lots. 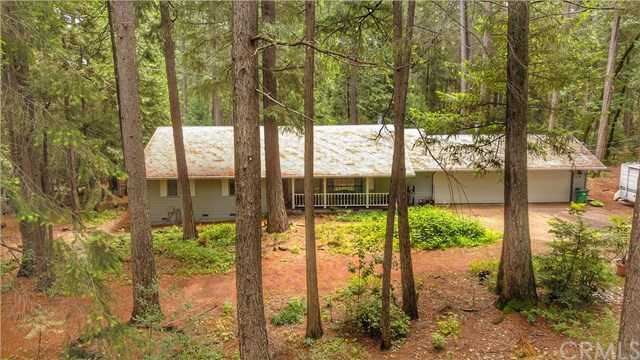 This home is only a few minutes from town, yet feels like your in the redwoods in a world of it’s own. This property was not effected by fire in the recent tragic occurrence. Property and photo updates soon. Please, send me more information on this property: MLS# OR18285519 – $433,900 – 14185 Nimshew Road, Magalia, CA 95954. I would like to schedule a private showing for this property: MLS# OR18285519 – $433,900 – 14185 Nimshew Road, Magalia, CA 95954.